As you know, I eat a lot of chocolate, ranging from local high end speciality chocolatiers to standard Hershey. I eat it all, but that doesn't mean that I like it all, I'm actually fairly snobby when it comes to chocolate. But if chocolates comes my way, I have to at least try it. 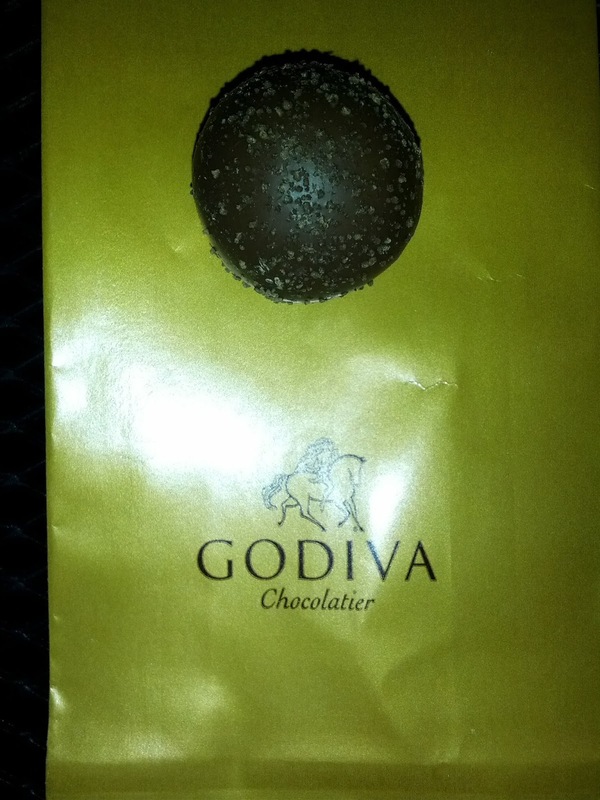 I always want Godiva chocolate to be better than it is. The offerings sound good. Godiva has fancy boutiques all over the city, where everything always looks so good and fresh, particularly the molten chocolate that they dip strawberries into. 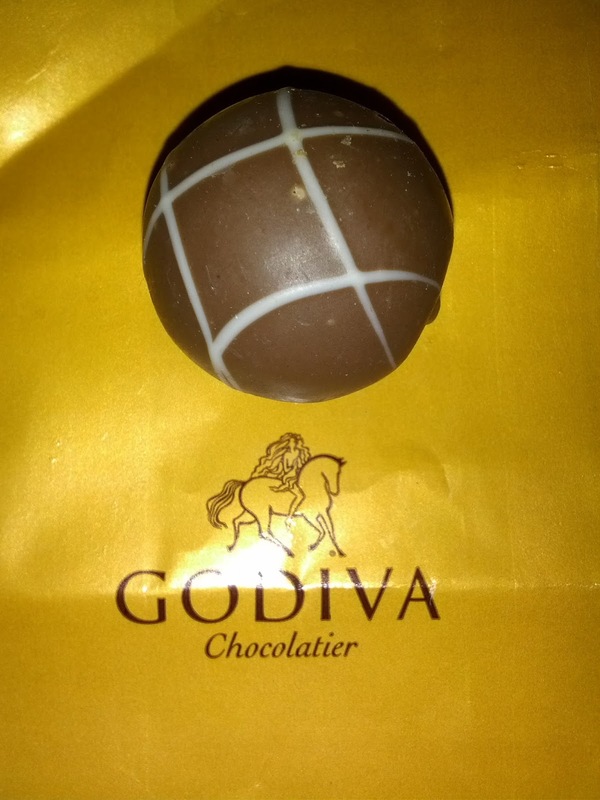 People keep bringing me Godiva. But it just doesn't impress. They also have a chocolate club, where just for signing up, you get a free piece every month. This means I've tried a lot of Godiva chocolate over the years. After trying nearly the entire lineup, my opinion is basically unchanged, except that I have finally found one that I do enjoy: the Chocolate Lava Cafe Truffle. I'd gladly consume more of those. But the rest? Meh. These are round balls filled with creamy ganache, similar to Lindt truffles. Described as "cream or butter ganache centre, enrobed with a fine film of chocolate and rolled into a ball, either in cocoa powder of different colours and flavours, coconut or other nuts." 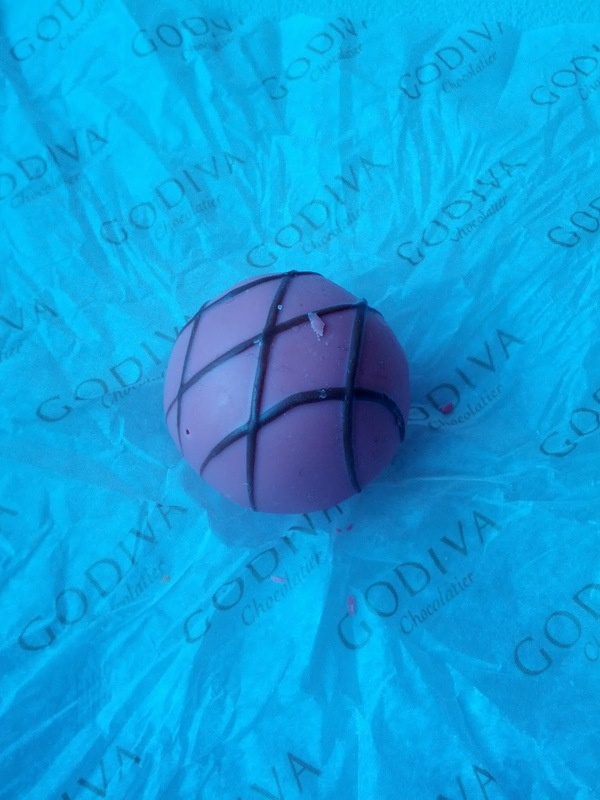 Thin milk chocolate layer, pink layer, fun little balls. Inside very creamy ganache that had no real flavor. Not sure what is "birthday cake" about it. Subsequent tasting: Just sweet and creamy, not worth getting again. "Butterscotch caramel and maple walnut cream in a milk chocolate shell, dusted with molasses. " This one was pretty strange. The outside of the shell had some crispy bits on it, which added a nice texture. I guess those were the "molasses", but it didn't quite taste like molasses. The milk chocolate shell was their standard, forgettable shell. Inside was a thin layer of gooey caramel. I didn't taste it to be particularly butterscotchy, it was just sweet caramel. Then there was a thicker layer of what I guess was the maple walnut cream. It was kinda bitter, but had a nice grittiness to it from the walnuts. I'm not sure where the "brownie" part of the name comes in. This wasn't bad, but wasn't particularly good. This was actually one of my favorites. I’d even say I liked it, which I can’t say for pretty much any other Godiva truffles. The inside was liquidy, but not too runny. 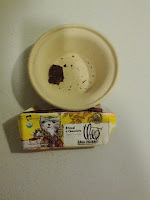 The dark chocolate flavor was complex, in the shell, the ganache, and the “liquid fondant”. It paired beautifully with my coffee. I’d actually get this one again. Update: I got it again. And again, I really enjoyed it. 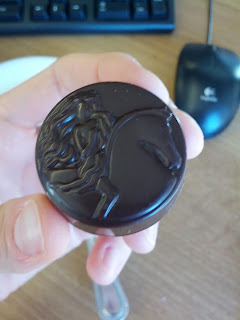 Dark chocolate with some real body to it, very pleasant smooth fondant inside. I think this is my new go to! "Creamy coconut filling accented with coconut flakes, in a milk chocolate shell." 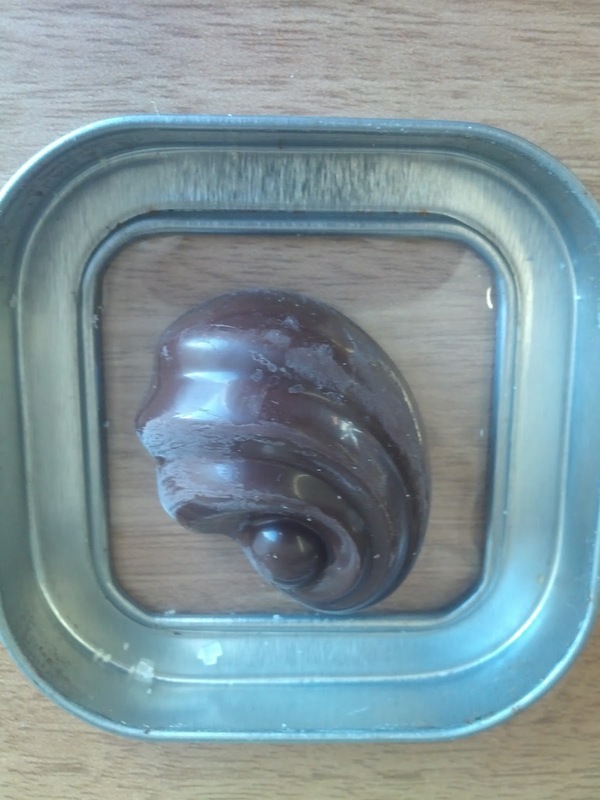 Unremarkable milk chocolate shell. Filling was very sweet, with some coconut flavor. I didn't really find any flakes, which I would have liked. Honestly, I liked a Mounds more than this, it had more coconut flavor to it. “Strawberry puree and vanilla mousse in a white chocolate shell”. Wow, this was seriously sweet. I might have liked it with a black coffee or something, but on its own, it was way, way too sweet. The inside was divided into two halves, one was the strawberry puree and one was the vanilla mousse. The “vanilla mousse” was really just some creamy sweet stuff. The strawberry puree was just thick, fruit colored stuff. I didn’t taste vanilla, I didn’t taste strawberry. 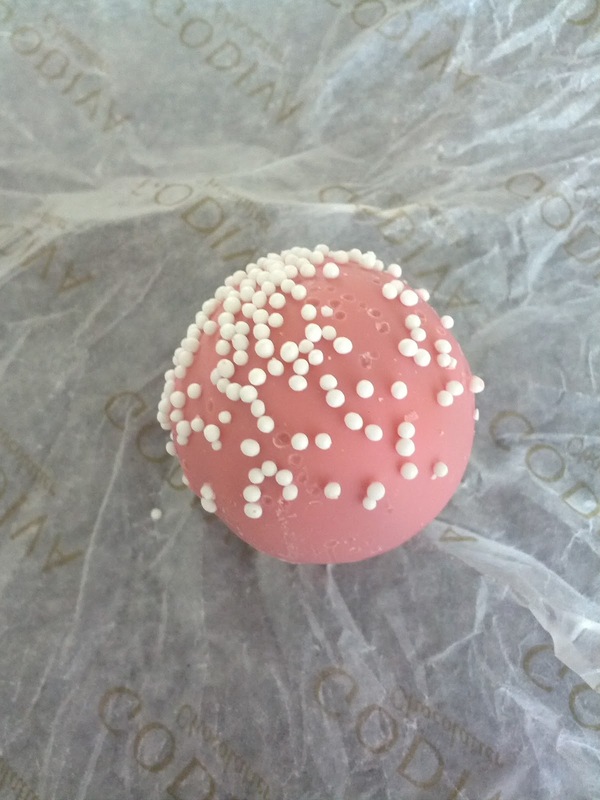 Surrounding it was a layer of milk chocolate, then a pink layer of white chocolate. The chocolate wasn’t remarkable. Now, this sounded amazing, given my love for dessert, creme brûlée, and chocolate. But what was it actually? A white chocolate shell, with candied sugar crunches on outside, split inside with half dark chocolate and half vanilla ganache. Um, not creme brûlée. How is this creme brûlée? The crunchy sugar on the outside? Meh. It was just sweet, fairly crappy white chocolate. Not good at all. The sugar crunchies were the only good part. No red velvet flavor, just white chocolate coating, dark chocolate shell with some sugary cream inside (they call it ganache, but I wouldn't). Not good. 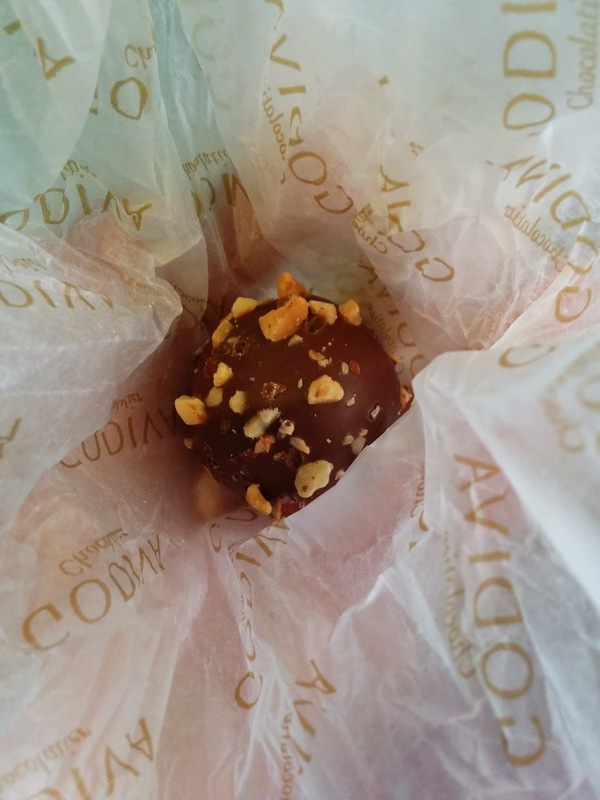 "A smooth and subtle center of milk chocolate and almond praline with salted almonds." This was better than many of the milk chocolate truffles, but I still wasn't a big fan. Again, the milk chocolate shell just wasn't creamy. The inside was an almond praline, slightly sweet, slightly salty, which was enjoyable. I also liked the crunch from the almond bits on the outside. It wasn't awful, but I wouldn't get it again. "Rich, creamy hazelnut praline blended with crunchy hazelnuts and crispies achieves textural perfection inside a shell of pure milk chocolate topped with crunchy nut pieces." I liked the little bits of hazelnut on the outside, as they gave it a fun crunch. But the milk chocolate shell was again not good, it had a strange bitterness to it, not good bitter like dark chocolate. The center honestly didn't taste like hazelnut or much of anything really, although it was obviously not chocolate. I didn't like this at all. "Cookie dough ganache in a milk and white chocolate shell, topped with dark chocolate chips." A little minty, but not much. Smooth creamy ganache. Not remarkable. "Pistachio and white chocolate ganache in a white chocolate shell, topped with pistachio bits." This was better than I expected. 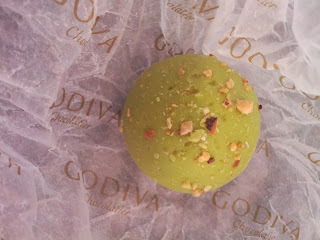 The inside was a creamy, slightly pistachio-y flavored ganache. 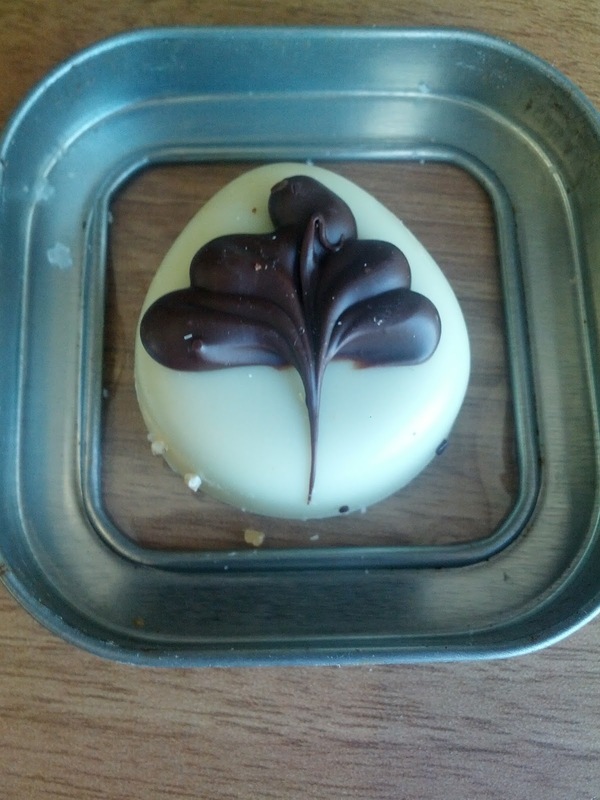 There was then a thin dark chocolate shell, and then the green colored white chocolate shell. Both were standard Godiva, not remarkable. I liked the crunch from the pistachio on top. I wouldn't get another, but this wasn't bad. "Dark chocolate ganache flavored with cinnamon, vanilla, and exotic spices inspired by an ancient Aztec recipe, all in a dark chocolate shell sprinkled with red cocoa." Meh. I honestly didn't taste any spicing. 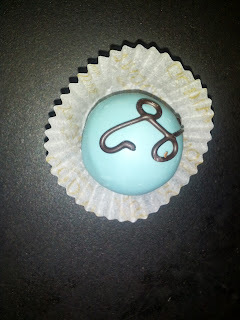 The inside was chocolate ganache, creamy, but not that flavorful. The dark chocolate shell was totally unremarkable. The red cocoa on the outside is the only thing I really tasted, added a bit of bitterness. I was hoping this would be more like the Chocolate Lava Cake Truffle that I had enjoyed, but somehow both the ganache and the shell failed to compare. "Pumpkin spice ganache in a milk chocolate shell." This is the only one I've seen with ... packaging? 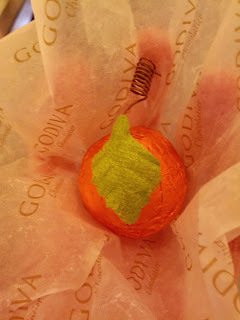 Wrapped in orange foil, with a cloth leaf, and a metal twirly stem. Super weird. 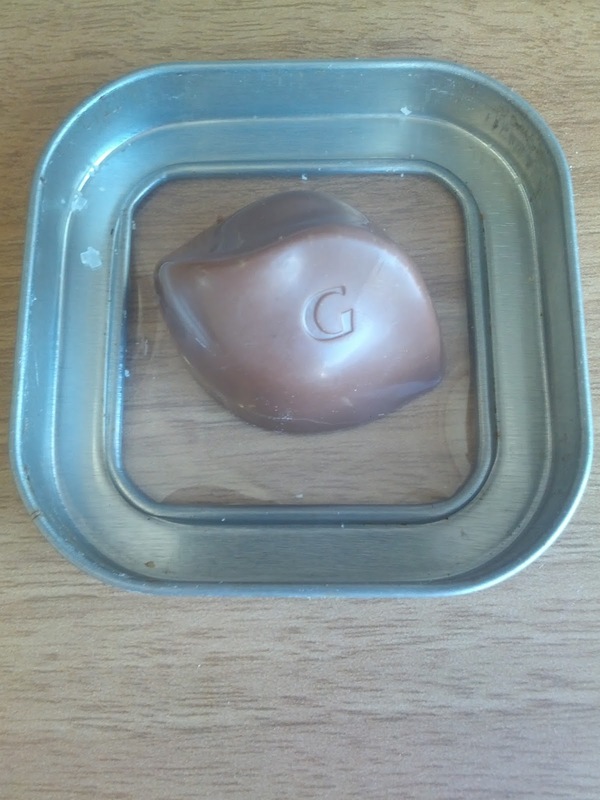 Also amusing is that they then wrapped it in the Godiva paper, as they normally do with the non-packaged truffles. Anyway, the truffle. Once I removed the foil, the pumpkin spice aroma was strong. Perhaps that is why they wrap it? The milk chocolate shell was the same as always, and I just don't like it. The ganache was orange-ish, creamy, and I guess pumpkin spiced, in that it certainly had nutmeg. I didn't taste any pumpkin, and it didn't promise to have pumpkin, just the spices, so I guess that makes sense. I imagine there was cinnamon too, but all that came through for me was the nutmeg, a bit too strong, so it had a kinda soap-like finish. Thanks for playing the pumpkin spice game Godiva, but not really a winner. White chocolate shell, pink minty filling. There was a lot of white chocolate going on here, the shell was thick and there was a band through the center as well. And it was the cloyingly sweet version of white chocolate that gives it a bad rep. The inside was creamy, minty, and uh, pink. The mint flavor was quite nice. I think this would be decent paired with a rich, dark hot chocolate, something to compliment the peppermint, but also help cut the sweet. Or maybe just put this filling into a dark chocolate shell. "Rum flavored milk chocolate butter cream, enrobed in dark chocolate, rolled in dark chocolate flakes." The inside butter cream was a bit boozy and creamy, which was nice. But the shell was a bitter, unpleasant dark chocolate. The chocolate flakes it was rolled in added interesting texture at least, but not good taste. Would not get again. 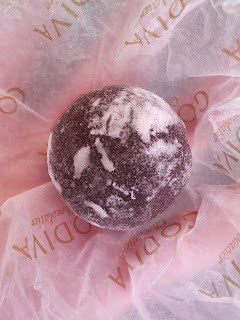 "Luxuriously soft caramel blended with gourmet sea salt nestled inside a dark chocolate shell." The filling was indeed a very soft, almost gooey caramel. I didn't taste any sea salt however. The dark chocolate shell was better than their milk chocolate, but I still wasn't into it. 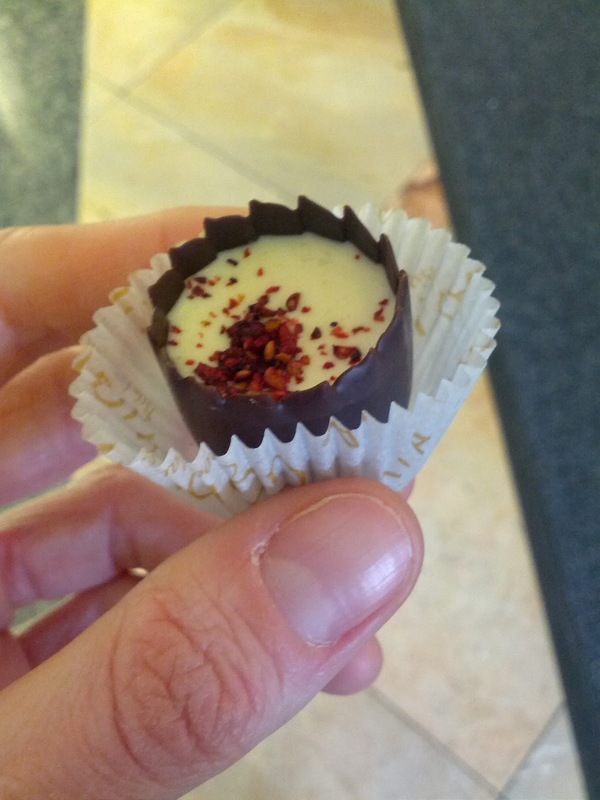 "Pumpkin spice ganache and cheesecake ganache in a milk chocolate shell". This was another one split in half, with one part the "cheesecake" ganache that was just sweet and tasted nothing like cheesecake, and the other part the pumpkin spice, which did have some spiced flavors, but wasn't all that good. Dark chocolate shell, nice carmely ganache filling, one of the better pieces I've had. Filling was creamy and nice, chocolate flavor was decent. The parfaits are one of their newer collections, basically chocolate cups filled with some sort of ganache, usually in several layers. They all have amazing sounding names. The retail for a whopping $2.50 for a small piece of chocolate! "Creamy vanilla cheesecake tops a tart raspberry ganache in a dark chocolate cup, topped with raspberry bits." Hmm. 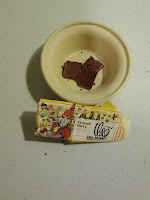 The shell was very thin, slightly bitter dark chocolate. I didn't think it went well flavor-wise with the sweet filling, it contrasted harshly. A white chocolate shell would have been more fitting. The raspberry bits on top were very off putting, they seemed like just gritty raspberry seeds. The top layer was the "creamy vanilla cheesecake", which was very creamy, but I didn't taste any vanilla nor cheesecake. 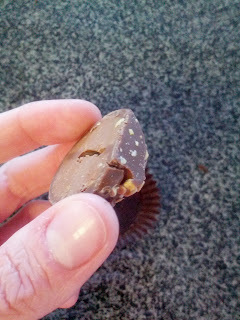 The bottom layer was the "tart raspberry ganache", which was raspberry flavored, and the consistency of caramel. Overall, the flavors did not come together, the textures were wrong, and I would not get another. Ugh, I hated the raspberry bits on top! Described as "extremely smooth filling obtained by mixing full cream which is added to the chocolate and stirred until a smooth paste is obtained." Similar to the truffles, but shaped differently. 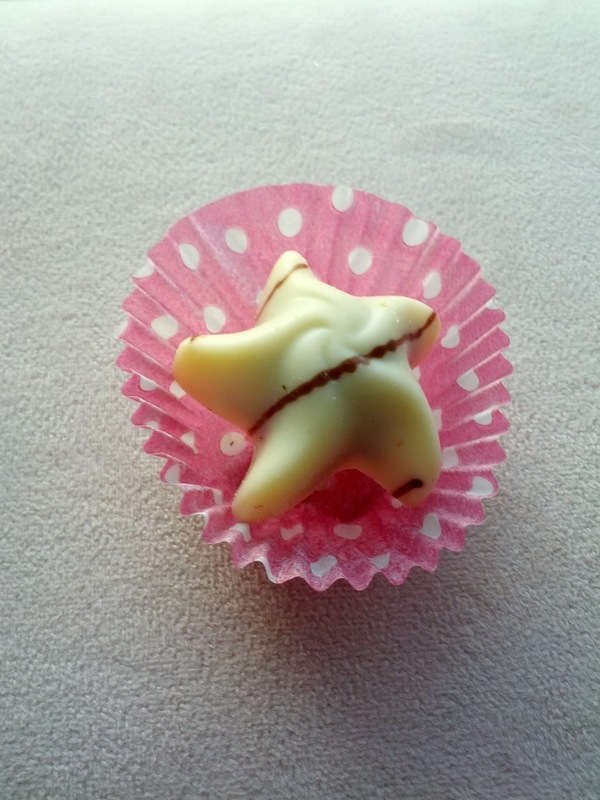 Dark chocolate filled with white chocolate ganache flavoured with madagascar vanilla." Smooth dark chocolate, filled with creamy ganache. Didn't really taste like white chocolate nor vanilla. Meh. "Dark chocolate filled with 85% cocoa and dark chocolate ganache". Smooth dark chocolate shell, shiny, sweet but a bit of complexity. Filling was creamy dark chocolate. I wouldn't get this again, but it wasn't bad. "Sweet and velvety chocolate cream blended with decadent cappuccino in milk chocolate." Melty, boring chocolate shell, filling was thick and sorta cappuccino flavored. Did not like. "Rich coffee infused chocolate ganache in a smooth white chocolate shell and adorned handycraft milk chocolate leaf." Subtle coffee flavor in creamy filling, boring white chocolate shell. 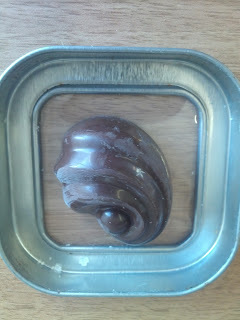 The shell was amazingly uninteresting - not sweet, not creamy, just there. Meh. 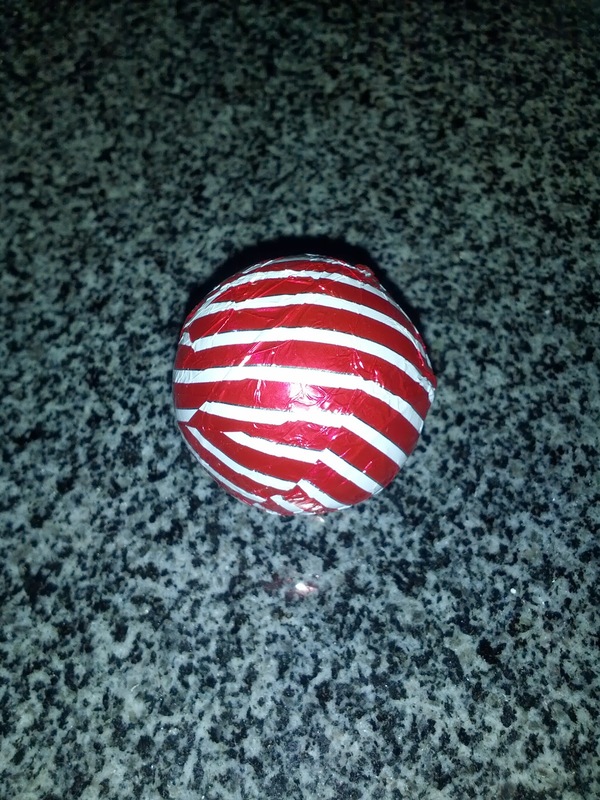 These are smaller than the truffles, individually wrapped chocolates. Dark Chocolate Gem: Tasting notes: decent dark chocolate but nothing spectacular. Dark Chocolate Caramel Gem: Tasting notes: kinda flavorless. Caramel is just sweet, chocolate isn’t interesting. 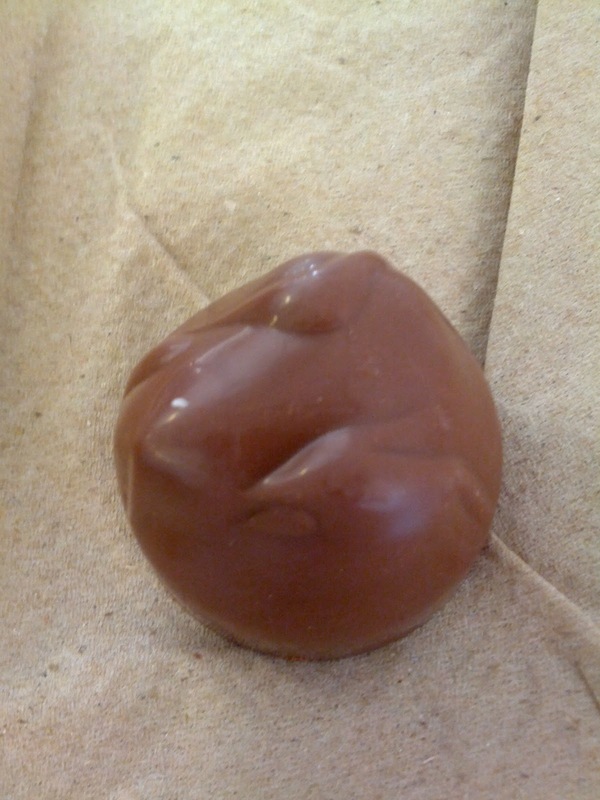 Milk Chocolate Caramel Gem: Tasting notes: same as dark chocolate caramel gem, just with milk chocolate. 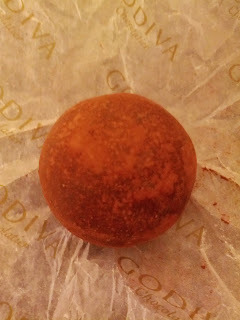 This line is described as "Finely ground and caramelised roast hazelnuts to which chocolate is added, producing the unique softness and gentle, nutty flavour that says Godiva praliné." "Soft praliné with shortbread biscuit and ground nougatine, in white chocolate, decorated with sugar coated hazelnut pieces." 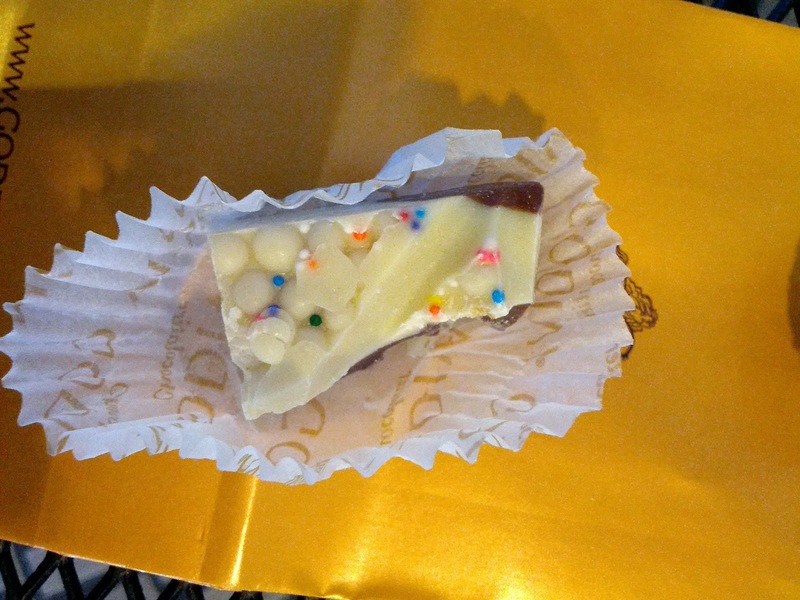 The white chocolate was the same sort of white chocolate that gives it bad name. Just kinda waxy and sweet. The filling was gritty and sweet, not very good. I really didn't like this piece. "Milk chocolate filled with roasted caramelized macadamia nut and a soft praliné with shortbread biscuit and ground nougatine". Smooth milk chocolate outside, creamy filling that seemed just chocolate, with a crunchy layer on top. The crunchy stuff was pretty sweet, I guess that was the caramelized macadamias, but I didn't really taste the nuts themselves, nor did I find any shortbread biscuit. 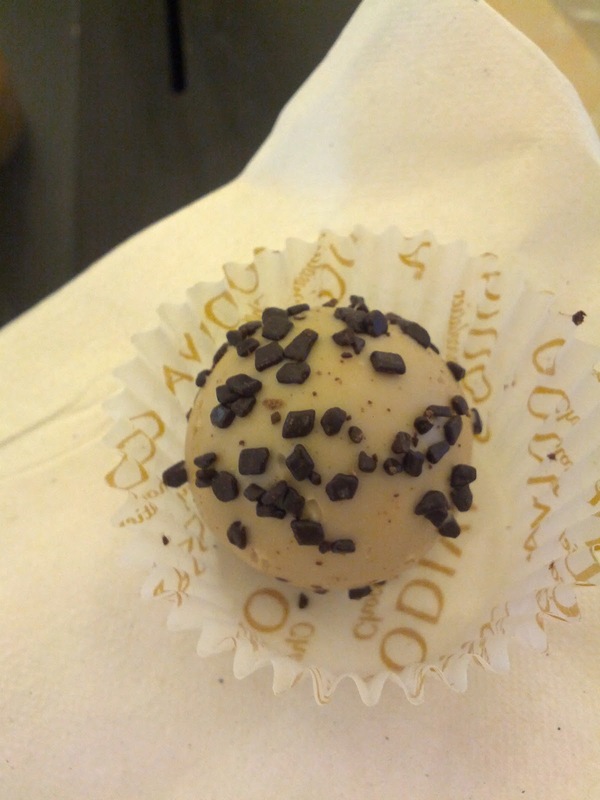 Only at select locations (the boutiques), Godiva also makes shakes, in several chocolate varieties. I had one of these that I loved once, but I don't have my tasting notes from it. Since then, I've tried a few samples from time to time. Milk Chocolate Decadence Shake (sample size). This was very icy, with not that great of chocolate flavor. 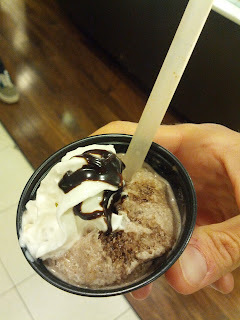 The whipped cream on top was nice, as was chocolate drizzle, but there wasn't anything impressive about it, and it really didn't seem like a "shake", much more just like blended ice and cocoa. $6 for a full size, I would never pay that for this product. "Strawberry purée blended with white chocolate flavor, topped with whipped cream and strawberry sauce." I walked by one day as they were just finishing off some samples of a new flavor: white chocolate strawberry. They looked delicious, and I remembered how much I loved the first one I had, so I gleefully took a mini-shake. It was again just very icy, vaguely white chocolate flavored I guess, which just sorta means sweet. I found out why they have seemed so icy though - it turns out, they aren't actually milkshakes! The guy handing out the samples initially said, "White Chocolate Strawberry Milkshake", and the other Godiva employee immediatley corrected him, "Not milkshake, just shake". Someone else asked what was in it, and the mystery was solved: ice, blended with white chocolate powder, and I think she said something about white chocolate chips. No wonder it tasted like blended ice, it was blended ice. The consistency was really nice though, and I loved the texture from little bits of something ground up inside of it. The whipped cream was generic out of a can, and the raspberry drizzle was sweet but good. Overall, tasty-ish, but I'd never pay for a real one, a whopping $6 each for just sweet blended ice? "White chocolate crisps immersed in creamy white chocolate and birthday cake flavors layered on smooth milk chocolate and topped with colorful sprinkles." Available in the boutiques only. The white chocolate wasn't very interesting, not really sweet, just waxy and there. 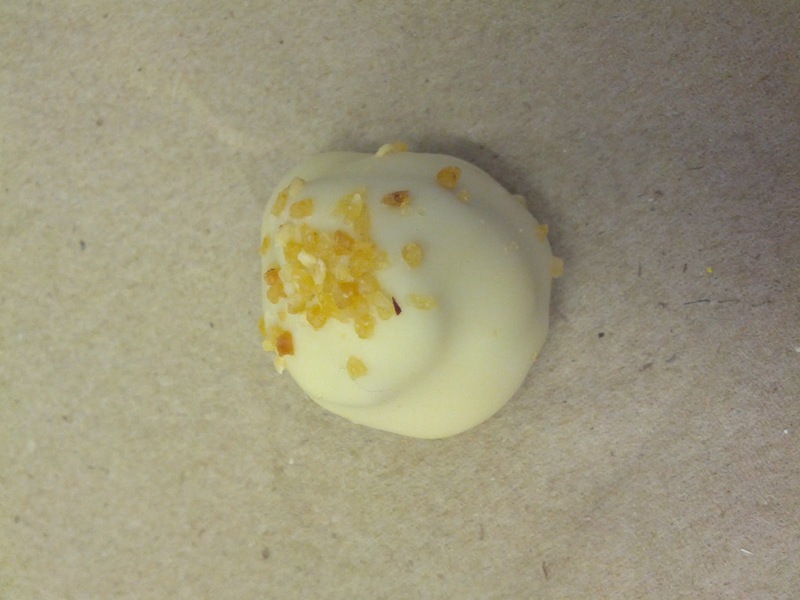 The white chocolate crisp balls added a little crunch, but I didn't really care for them. The sprinkles were cute, but lost. The milk chocolate was the same as the rest of theirs, just not very good. I really did not like this. The white chocolate was very boring, waxy. But the filling just had an awful flavor to it. It was a pink liquid, I guess raspberry. Would never get again. Strawberry Truffle Bar: "Sweet strawberry purée enrobed in creamy Godiva milk chocolate." Tasting notes: fairly creamy decent milk chocolate, strawberry interior just gooey and not very interesting, sorta like strawberry toaster strudel filling. Shell with Passion Fruit and Banana: Tasting notes: dark chocolate shell, not particularly complex, fairly creamy for a dark, does have some good bitterness. Inside is two compartments, one of each filling, fillings are just sweet goo, not particularly flavorful or good. I've probably mentioned this before, but most mornings, a few co-workers and I take a mid-morning break to sample some chocolate. We each take turns bringing in different chocolates. One of my co-workers recently went to Seattle, and came back with some chocolate from Theo, a Seattle based chocolatier. Another co-worker once visited from Seattle and also brought some along. However, I was first introduced to them locally at the Good Food Awards. I've tried a variety of their bars, all of which were decent, but no real standouts. Theo and Jane Goodall 70% Dark Chocolate. Blend of beans, contains cocoa butter and vanilla. 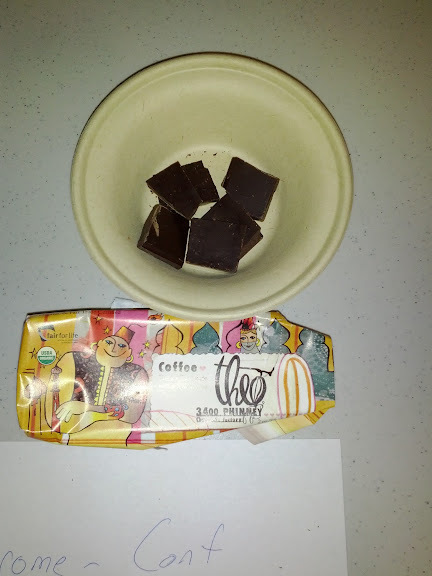 Tasting notes: This was a nice smooth dark chocolate filled with fruity flavors. I think this was the cheapest and most commercial bar at the Good Food Awards, but I found it pretty complex and nice. Coconut Curry: Milk chocolate with toasted coconut and savory curry spices. Tasting Notes: Decent quality milk chocolate with very strong curry flavors. I’m not exactly sure when I’d want this bar, but the curry and chocolate did work together surprisingly well and the level of spicing was very intense. There was no doubt what this flavor was! I have the Vosges Naga bar in my collection I received at Christmas, it will be interesting to compare the two, as it is also curry, coconut, and milk chocolate. Bread & Chocolate: 70% Dark Chocolate, “with buttery, toasted artisan breadcrumbs and the perfect amount of salt." Tasting notes: This had little tiny crispy bits of bread in it. Dark chocolate was good quality. Bread and chocolate go together fine, but this was pretty subtle due to the size of the chunks. Interesting concept, but I would have preferred bigger chunks. But then, I guess there probably would be issues with freshness? Coffee: 70% Dark Chocolate: “Dark chocolate and a robust locally-roasted organic, Fair-Trade-Certified™ coffee from Caffé Vita”. Tasting notes: I didn’t get much coffee flavor at all in this bar. Decent dark chocolate. Hazelnut Crunch: “A generous combination of hazelnut brittle and milk chocolate with just the right touch of salt.” 45% milk chocolate. Tasting notes: bits of hazelnut and bits of crunchy candy bits throughout. Give lots of crunch but not a lot of flavor. Kinda standard milk chocolate. Very nice salt on finish. Fleur de Sel Dark Chocolate Limited Edition: “Rich 70% dark chocolate is punctuated with crunchy bits of "salt flowers,” Tasting notes: fairly smooth, but nothing extraordinary. Kinda generic medium-end dark chocolate. Nice salt bits. Salted Almond Milk: Tasting notes: Creamy, soft milk chocolate, but not particularly memorable. Slight salt on finish, but not as much as you’d want. Almond slivers add a nice crunch, but not much. Pretty unremarkable, but better than Hershey. 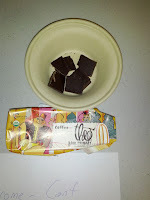 91% Dark Chocolate, Costa Rica: Tasting notes: Again, serious snap. Deep chocolate flavor, very rich, brownie like. 84% Dark Chocolate, Ghana: Tasting notes: Serious snap to it. Almost chalky. Not greatest mouth feel. Deep chocolate flavor. I continued my quest of redeeming free birthday coupons to another destination I hadn't been to in years: Del Taco. When I was growing up, we went out to dinner every Sunday night. It was my mom's night off from cooking. But when I say we went out to eat ... I mean that we went to Subway, Papa Ginos, or Del Taco, depending on who was picking. Del Taco was always my dad's pick. It was my least favorite of the batch, but it should come as no surprise that I was willing to go, if only for the fact that they had ChocoTacos! (Remember those things? Waffle cone taco shell, filled with ice cream and fudge and peanuts? Dessert and ice cream loving Julie loved these!) I also thought the taco salad was pretty good. Anyway, I don't think I'd been to a Del Taco since I was probably 15 years old. I got a coupon for two free chicken tacos, and even my freebie loving self wasn't interested in those. But then I got one for a free, premium shake! My dessert radar went off, and I was sold! Entering Del Taco was like entering anther world. There was drama the moment I walked in, as a woman had ordered some nachos, and then when told the price (which was higher than what was on the sign, since it included tax), threw a fit. She threw the nachos across the room and screamed that she didn't want them. And then the next person in line paid for their entire order in change, with nothing bigger than a dime. It was ... a cultural experience. The cashier was very friendly, called me "hun", and quickly prepared my shake. However ... I won't be going back. "Premium" Vanilla Shake, topped with "real whipped cream". The shake comes out of a machine, sort of like a soft serve ice cream machine, rather than being made from ice cream and milk. I have no idea what it is really made of, but I'm guessing the base is similar to soft serve ice cream, just with a ton more corn syrup. This thing was sweet! Besides sweet, there wasn't really much to it. I didn't taste much vanilla flavor at all. 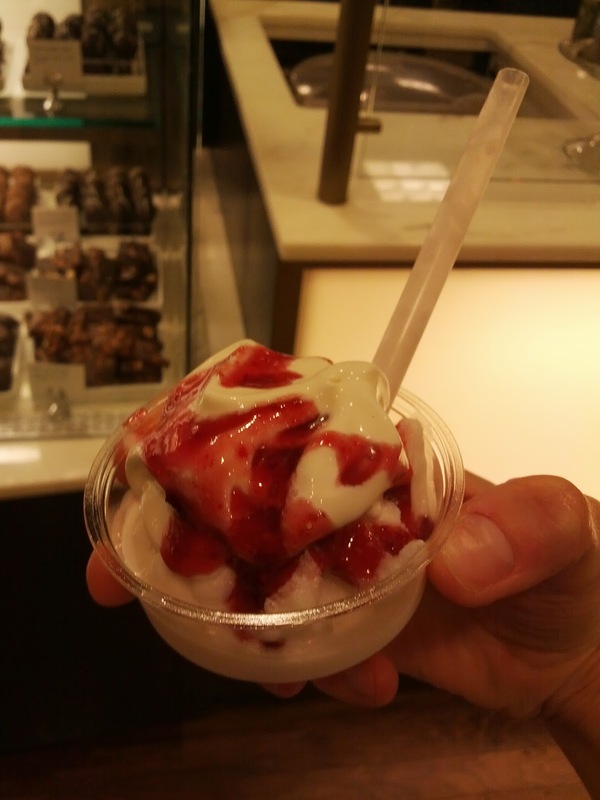 They also offer a chocolate and a strawberry variety, which are the vanilla shake with chocolate sauce and "real strawberry topping" mixed in. I decided to play it safe and go with the classic vanilla, but perhaps one of the others would have more flavor. The shake was way too thick to drink at first. Even 10 minutes in, I was barely able to drink it. The consistency was just sorta strange, way too thick to drink, but definitely not like ice cream. It also wasn't very icy. Just ... strange. 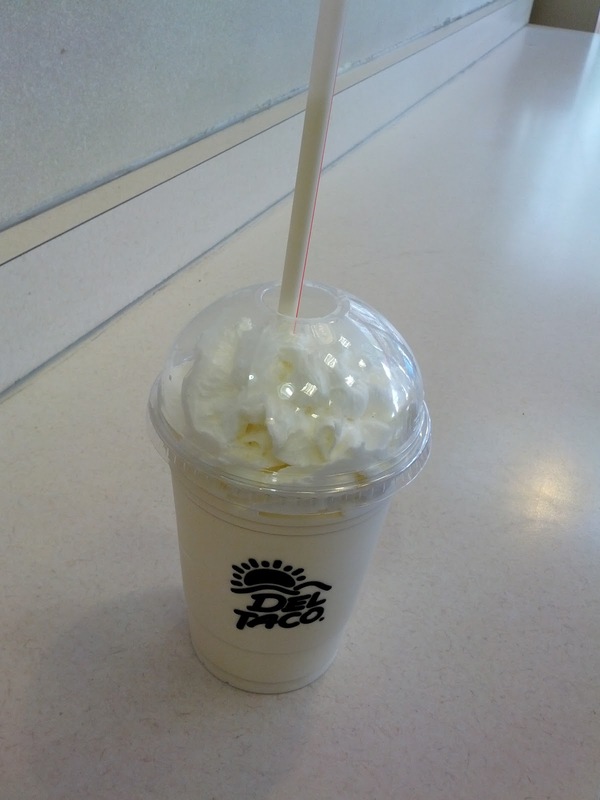 The whipped cream on top was advertised as "real whipped cream", so I somewhat expected a real canister of whipped cream or something, even though I was at fast food joint. It was just a regular generic can of whipped cream, and was surprisingly not good at all. I thought all canned whipped cream was pretty much the same, but this had a nasty sour taste to it. Overall, really not very good, but I somehow finished it, even though it was fairly massive. I think I kept wanting it to be good. After all, it was a "premium" shake! 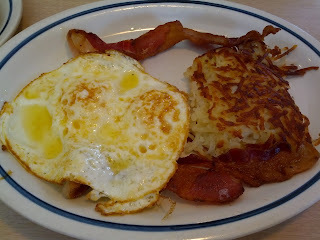 Yes, I went to IHOP. Ok, now that that shock is over. Let me shock you more. I didn't just go once, I went twice. Now, for some history. When I was in graduate school, the local IHOP had a promotion on Tuesday nights, for 50% off. This was huge. The amount of food we could get for $4 was incredible, and as a grad student, something that really did matter. So we went, basically every week. And honestly, I loved it. I had a bunch of favorites, including the "International Passport" breakfast with the Swedish pancakes (basically, crepes with ligionberry jam and ligionberry butter) or the Harvest Grain 'N Nut pancakes. And of course, everything comes with a slew of sides, like crispy hash browns, eggs, etc. I hadn't been to an IHOP since graduate school, but I've been on a serious brunch kick lately, just really loving and craving brunch foods. And, IHOP of course offers a free birthday meal, and you know what fun I've had cashing in on my free birthday items! So, I went. The first visit was far better than the second. The food was pretty decent, served really hot and fresh. I loved that I got to go to brunch, on a Sunday, in San Francisco, and (gasp!) not wait for two hours. And while the eggs weren't organic, or free-range, or anything special, it seemed like their short order cooks knew how to cook eggs. And their pancake recipes are dialed in, this IS what they are known for after all. Unfortunately, my second visit was no where near as successful, everything was overcooked and cold. I won't be going back anytime soon, but it was kinda fun. 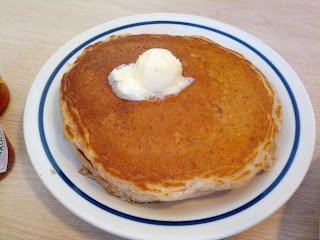 On both visits, I got the Pick-A-Pancake Combo: "Your choice of two same-flavored famous pancakes. 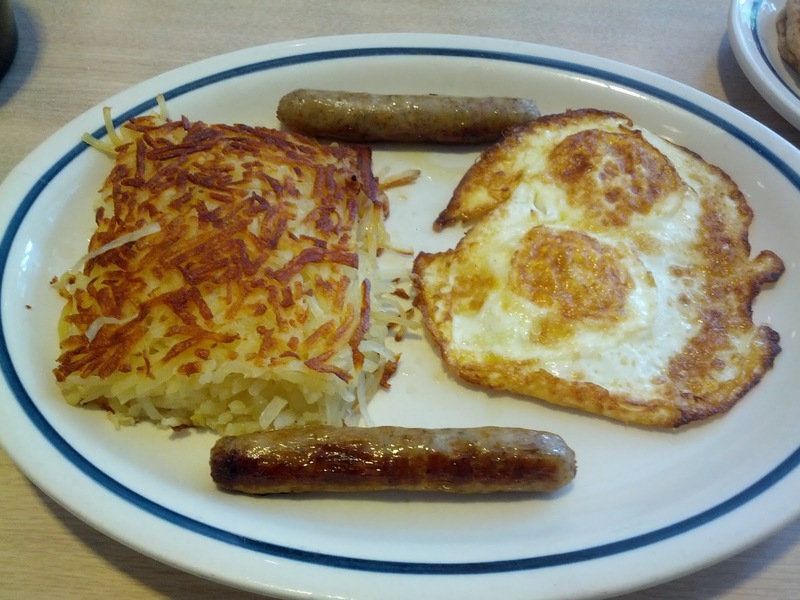 Served with two eggs, hash browns and your choice of two bacon strips or two pork sausage links." 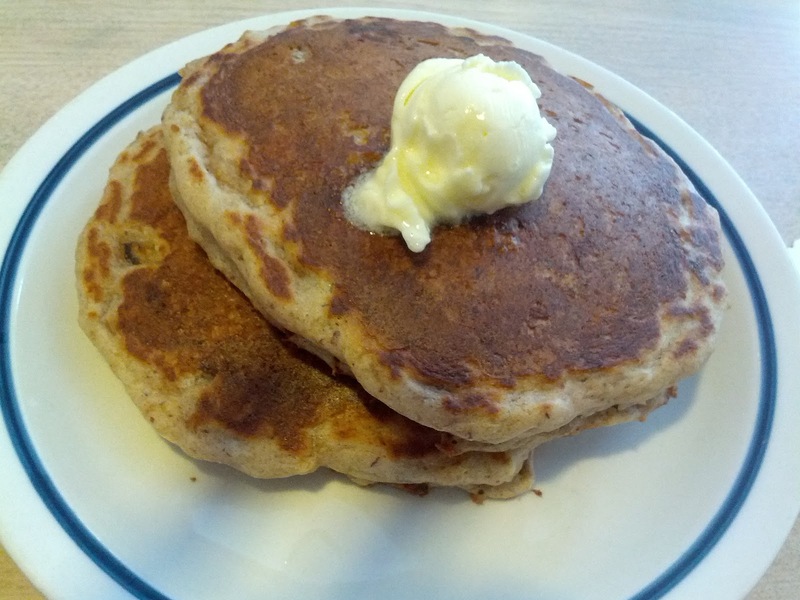 I went with my old favorites, the Harvest Grain 'N Nut Pancakes: "pancakes made with hearty grains, wholesome oats, almonds and English walnuts." Since I liked them the first time, I couldn't resist getting them again the second time. This also gave me a great comparison point, so I could see how inconsistent they were. Certainly, lots of food for the regular $9.69 price. Service was fine both times, exactly what you'd expect. No complaints, although perhaps it was the server's fault my food came so cold the second visit? But she did wish me a happy birthday. If you want a free brunch, I recommend joining their club, it is one of the better birthday freebies I've found! 2 eggs over medium, hashbrowns, bacon. My sides, on visit #1. Mmm, look at the pool of butter/oil on top of the eggs! The eggs were ordered over medium, but the yolks were totally runny. They were still pretty good though, the whites not too tough, and served nice and hot. Nothing extraordinary, but better than eggs often are. The hasbrowns were quite good. Crispy exterior, fluffy interior, well seasoned with salt. Again, not extraordinary, but better than most. I loved the crisp outside layer. I didn't have the bacon, and gave it to my dining companion, who said that it was fairly standard. 2 eggs over medium, hash browns, sausage. My sides, on visit #2. It turns out, consistency is not IHOP's thing. I guess I lucked out on the first visit. Had these been the sides I received the first time, it is less likely that I would have returned. The eggs and hash browns both arrived fairly cold. The first time, the eggs were slightly less cooked than I wanted, but decent enough. This time, they were way over cooked, the yolks 100% solid, the whites tough and rubbery and even burnt. They weren't good at all. The hash browns came in a much bigger portion. They were nicely browned and crispy on each side, but lacked seasoning. This was fine, as I could add salt, and mostly ate them with ketchup and syrups anyway. I didn't have the sausage, but it looked well coked and nicely browned. Harvest Grain 'N Nut pancakes. And the reason I was there. The pancakes! These were just as I remembered. Moist, fairly fluffy. The mix includes oatmeal and little chopped up nuts, giving them a great texture and a nice heartiness. Really better than a lot of pancakes I have. And the giant mound of butter just made for more deliciousness. I shocked myself by realizing I ran out of butter and wanted more, which I never expected when I first saw it. Again, consistency is not their strong point. As you can see, these were overcooked. Not burnt exactly, but definitely left on the griddle for too long. They weren't nearly as fluffy as my first visit. They were also slightly smaller. And like my sides, served barely lukewarm. Syrups: Rooty Tooty Fresh 'N Fruit Blueberry, Rooty Tooty Fresh 'N Fruity Strawberry, Butter Pecan, Old Fashioned. IHOP is known for their collection of syrups that are always on the table. The flavors have varied somewhat over the years, but these are the ones that seem to have stuck. You can even purchase them in the stores now to enjoy at home! The syrups are all just flavored corn syrup, but they do the job. I say this as someone who had never experienced fake maple syrup until college. My godfather makes maple syrup and his was the only kind I'd ever had growing up. I didn't know fake stuff existed. And then a tragic day in college I learned about "pancake syrup", when I complained to the kitchen, after thinking something had gone bad with the syrup. Anyway. My favorite both times was surprisingly the Rooty Tooty Fresh ‘N Fruity Blueberry syrup. Although clearly just sweet blueberry flavored corn syrup, I thought the flavor was nice and it went well with the hearty pancakes. My second favorite the first time was the old fashioned, just fake maple syrup. Not the best maple flavor, but it worked. A close tie for second the first time was the butter pecan, but it was a little too sweet for me, and I didn't necessarily taste the pecan. On my second visit, I preferred the butter pecan. Both went well with the pancakes and the hash browns. Last place goes to the Rooty Tooty Fresh ‘N Fruity Strawberry, which I really didn't like at all, it was just sweet and fake tasting. On the second visit, I tried it again, and again thought it was quite horrible. Coffee comes by the pot only. Since I ordered decaf, it was brewed fresh for me, which was nice, but it didn't arrive until after my food. I had wanted to sip on it while I was waiting and with my pancakes, to help balance the sweetness from the crazy amounts of syrup I was using. Anyway, the coffee was fine, not offensive but not particularly good. $2.49 seemed really pricy though, particularly given how cheap the food was. I didn't bother getting it on my second visit.